Giddy Greetings: One World One Heart Giveaway! Comments are now closed. Thank you to all who entered. Wow! Over 400 entries! The winner will be posted shortly. Read all about it, I know it's a long post but it's worth the read. It's a great event with my 2nd year participating. Thank you Lisa for another great event for the chance to meet new people and gain new friends. So on to what I'm giving away to a great visitor on my blog. Leave a comment to let me know you were here. I promise to head over to your blog and visit you as well. My gift is something that I think anyone can use from scrap bookers, card makers and artists as well. It's a Zyron 5" Creative Station. I will draw the winning person's name on February 16th and let the winner know via email. I will ship internationally so anyone can join in on the fun. It's nice to meet you and see you soon! As seen on the Martha Stewart Show . Creates stickers, magnets, labels, and laminate out of almost any item. Simply feed the item in, turn the handle and trim. Applies an even layer of adhesive to items up to 5" wide. 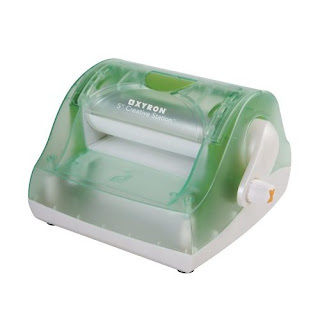 Instantly laminates items up to 4.5" wide. Change applications quickly with easy load cartridges. Includes a 5" wide x 18' long acid-free permanent adhesive cartridge, inspiration sheets and manual. Here's a video to see what it can do, courtesy of Xyron. Visit my other blog and my other blog for another giveaway too! Two more blogs to win from! Thank you again for visiting and I look forward to meeting you soon! That's for the chance to win! I don't have a blog but I am thinking about starting one! Monica, this is a wonderful opportunity for us all! And waht a nice prize you are offering! Thanks so much! Blessings to you! What a terrific prize! Thanks so much for giving! What great giveaway! Thanks for a chance to win! Great giveaway! Please add my name to the hat! Don't forget to head over to my blog (#98 on the magic carpet) for a chance to win, too! How wonderful, do enter my name into the hat,Linda:) and visit us at.. I'd love to win this.... please include me! 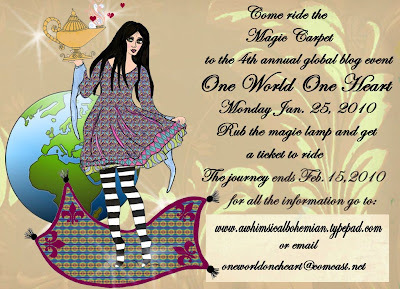 This is my first year participating in the OWOH magic carpet ride! What a great giveaway! !Please count me in. I'm loving your blog! Wonderful to find such lovely new blogs! Enjoy the blogging event! Great giveaway for a great event. What a great prize! Someone is going to be very lucky! Thank you for the chance to become a happy owner. And thank you for taking the time to visit my OWOH blog earlier today! What a generous giveaway! Thanks for visiting my blog to enter mine! so many wonderful bloggers I am meeting! Wow, what a great giveaway! Thanks for stopping by my blog! Good luck! I would love winning this. I would love to be considered in this drawing. How fun! Throw my name in, too! Hi Monica! What a creative giveaway; I'd love to be the winner. Thank you so much for stopping by Foxy G's Den of i-KNIT-quity, #113 on the Magic Carpet Ride. That is a lovely gift! Please include me in your giveaway and thanks for visiting my blog! What a beautiful give away, would love to be entered in your draw. Hello Monica! Wow, your giveaway just increased my heartbeat, what an awesome item to giveaway! OMG! what a fantastic giveaway!! Please add my name!! Wow! That looks like fun! I would love to be included in your giveaway! Thank you so much! Oh! This is such a fun giveaway! I know I would use that lots and lots!!! I hope you can hop on over and enter mine, too! hi there! what a great giveaway, please enter me! Please enter me in your give-away! Thank you! Wow...excellent giveaway! I love your blog and will definitely be back soon! Please include me in the drawing and thank you! Wow indeed! What a great prize! Your winner will be a very lucky person! Count me in! what a generous giveaway!! count me in please!! OHHHHH, I don't have one of these!! !please add my name!!! What a wonderful giveaway. This is right up my alley! Please enter mr in your great drawing. I'm crossing my fingers. Don't forget to come see me too. This is really a cool gadget! I'd love to win. I enjoyed browsing your blog too. Oh myyyy!!! !, I'm thrilled, please enter me in the drawing, I'd loveeeeeeeeeeeeee to win :P! Oh golly, I SO want to win this! WOW! Awesome giveaway! Thanks for the chance to win! I'd love to be entered for a chance to win this! I'm participating for the first time, so stop by my blog to enter my giveaway, too! That is one wonderful prize. Please enter me in your drawing. As a papercrafter I'd LOVE to try one of those! Monica, this is truly a fabulous generous giveaway! My goodness! WOW!!!! this is a great giveaway, would love to be entered in your drawing. This would be so nice to have. Thanks for the generous and wonderful giveaway. Thanks for entering my giveaway too! Hi Monica! What a fabulous giveaway you have here, it would have helped me while I was making mine!!! LOL I'd love a chance to win this, thank you! Please stop by my blog for a chance at mine if you'd like, #396 on the Magic Carpet Ride!! I am not new to your blog and I really enjoy it. I have a blog but am not sure how to add wallpaper and the like to dress it up a bit. I wold love to have someone design it for me but alas no money to do it. I like the one Heart idea as it is nice to meet and get to know people from all over the owrld! Blessings to you and all who take part in this event! Thank you, Monica, for stopping by my blog to enter my giveaway!! Good luck! Wow...what a wonderful item you're offering!! Very nice. I'd love to put my name in the hat! Thank you!! stopping by (#52) to enter my beaded bracelet giveaway. I will come again to join your wonderful art! What a perfect and generous gift. I would be delighted to win it. I knew I was going to love your blog when I saw your colorful blog banner. I'm # 79 on the magic carpet ride. I am having so much fun hitting all these wonderful blogs! Please enter me in your great giveaway. Woow what a great giveaway. Please count me in. Thank you. Please feel free to drop by my blog # 153 on the magic carpet. Great giveaway, please enter me for a chance to win !! Wow! I almost bought one the other day, so I KNOW I could use one...:-) Great giveaway Monica. Thanks for stopping by mine too. What a FANTASTIC giveaway girl...PLEASE enter me in your drawing!!!!!! I would also like to THANK YOU for stopping by my blog!!!!!! I hope you have a very blessed day!! Wow, what a terrific giveaway! Please add my name to the hat :D Thanks for stopping by my blog earlier. Wow! I need eliminator so bad! I am crossing my fingers! Please please please! Thanks so much! And thank you for stopping by! Wow, what an awesome and generous giveaway, Count me in please and pleased to meet you. How cool is your giveaway? I could certainly use that so please thrown my name into the pot! Thanks for visiting my blog as well. Very nice giveaway. Please count me in. What a fabulous giveaway! I've been wanting a sticker machine! Monica, you are only the third person to actually answer my question "what makes your mind fly?" on my giveaway...thank you ever so much! Your giveaway seems fun.I've never used one of those. I could use this for scrapbooking! Thanks for the chance to win! What a neat prize! You are so generous. Please put my name in the drawing. Come visit my blog to see what I'm giving away! Great giveaway! I would love a change to win! wow, very cool gift giveaway! fantastic giveaway, please count me in. Why not pop over to my blog and join in my giveaway too. What a great prize, please count me in!!! Love your blog and your background!! here's to making new friends! Wow, it's a great giveaway, something someone wants but won't buy for themselves. Thanks! holy moly!! this is fabulous:) i'd love to be entered! I'd love to have one of these! Please enter me in the giveaway! Come and join my magic carpet ride too! How cool! Thanks for offering such a neat gift that will keep us all creating! This is SO cool! Yes, please include me in your drawing for this nifty machine. You are so right! I have a hundred things I want to do with that just looking at it! Glad you joined the Ride! Hop on the Magic Carpet and fly over to my blog to enter for my prize. (I'm #362) Isn't this fun! What an AWESOME giveaway!!!! This would come in so handy in my card making!! Please enter my name. It has been a while (I can only claim life as my excuse)... Please enter me for a chance and thanks so much for stopping by #234. What a generous giveaway! Please enter me and thank you for the chance. Hello, I am contacting you by email, as I do not have a URL to leave a comment. I love all your creations! How beautiful! I want to get into quilling, but never knew all the shapes needed until I saw you on U Tube . The butterfly was absolutely beautiful! I would love to enter a chance to win the give away on your blog! I have been wanting a Zyron machine for ages! I haven't won anything since I was a kid! Hoping to win your give away! Thanks again! Blogging is new to me but I am finding it very interesting and I am meeting so many people. oh my goodness! what a wonderful opportunity! WOW how generous, my friend has one of these and she says its awsome :) thanks for the chance to win. Thank you for flying by. It was a pleasure to meet you Monica!! Wow, what a fantastic giveaway. I've always wanted one of these. Thanks for the opportunity to win. You invited me here as well. Thank you again. You have a generous spirit. :) Again, it was quite lovely to meet you! what a great giveaway.I'd be over the moon if I won as I'm getting into paper crafting and altered art.lovely blog and love the colors you have used here on your blog too. thanks so much for the opportunity to enter the drawing. so delighted to meet you through this event. I hope you'll stop by my blog as well. Please pop by my blog too if you get a chance! Hello from Utah! Thanks for commenting on my blog! What a great giveaway you have!! Thanks for the chance to win! Have a great day! Awesome giveaway. I'n certainly not an artist but I sure could have fun creating things with it. Holy Moley, what a great prize! I'd love to win. What a generous giveaway - thank you! Thank you so much for stopping by my blog. Your giveaway items are wonderful. Please include me. I hope you have a wonderful weekend. Please count me in and thanks a lot for the chance. What a great idea! Thanks for the chance to win this great tool. This is great! so useful! Please, count on me too! ooooh! I would love to play with this fun machine! I am a crafty addict, and I can think of a million ways to use it. WooHoo -- I need a xyron -- I lost my old one in a move (well, maybe not lost, forever, but it must be in a mis-labeled box :)Please enter my name -- thank you!! My oh my would I love to win your Xyron! I am a card maker and have always wanted one but never took the plung! Crossing my fingers and holding my breath! What a fantastically generous giveaway - thanks so much for entering my name! I have a small Xyron that I often wish was bigger. wow - We would have fun with this gadget! What a generous and fantastic giveaway. I really love the quilled chocolates that you have done....very clever. Glad I had a chance to read your blog. A marvelous prize! Come visit my blog for a giveaway prize, too. What a great item, I should have asked Santa for one of these, but here's my chance to wish upon my genie in a bottle, that the magic carpet will cruise in with this sharp Creative station! I do lots of volunteer crafts so maybe I could be more creative! Wow what a generous gift please enter me in. gosh, i have wanted one of those forever. how generous! Fabulous please count my in. Such a beautiful blog!!! Please include me in your giveaway and come enter mine! What a great giveaway, a fun blog and the Twilight page post made me smile! I've never seen one of these before, but I know I could use it in my crazy quilting! What a cool machine, that would be so much fun to play with. What an amazing gift for those of us on the magic carpet ride! Thank you so much! Your blog is so busy and fun! Please enter my name in your drawing. Great Gift! Please throw my name in the hat too. Stop by my blog also if you have a moment. What a generous offering! Thanks. Wow ! This is a very generous giveaway ! Thank you so much for the chance to win. I hope your OWOH adventure is a rewarding one ! Cheers ! DANG!! What a fantastic giveaway, I'd love to win it! I’m also participating in One World One Heart. Please come by my blog and leave a comment to have a chance to win what I'm giving away. What a wonderful prize....I would love to be the winner...Please enter me in your drawing and visit my blog #25. Wow. This is great! I would love a chance to win. Please enter me in your giveaway. Hi "Giddy Greetings Quilling, Cards and Crafts," what a lovely idea and post you have. I love the creative station. I would use it all the time. I'd love to win. I absolutely love your gift. Please take time to visit my blog, too, for a chance to win my book, 16 x MOM: A Mastery of Motherhood. I'm working on getting all the country flags. I promise to revisit your's too. Nice to meet you and visit your blog! Oh I Love this giveaway! Think of the things I could make easily! I am having so much fun looking at all the wonderful blogs. I don't have a blog, due to arthritis I cannot type much at all but I enjoy surfing the net. Thank you for a chance to win.